Good morning! This week the Sunday Supper Movement is sharing Cowboy Cooking recipes with Certified Angus Beef® brand! Cowboy cooking is basically a hearty meal that is nothing fancy but it’s filling and delicious. I think a lot of my recipes fall into this category. I have to say I’m a little bit jealous that some of the Sunday Supper Movement influencers got to go to Kansas this weekend and visit a cattle ranch, eat some incredible food, and learn more about Certified Angus Beef® brand. I really wanted to go myself but I knew that flying in the third trimester just wasn’t going to happen. It looked like they had so much fun though and the food looked amazing! When I started thinking about Cowboy Cooking I thought about breakfast. 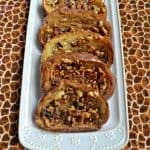 I like to host brunches at my house and usually make fruit salad, quiche, French Toast bake, desserts, and a few other things. 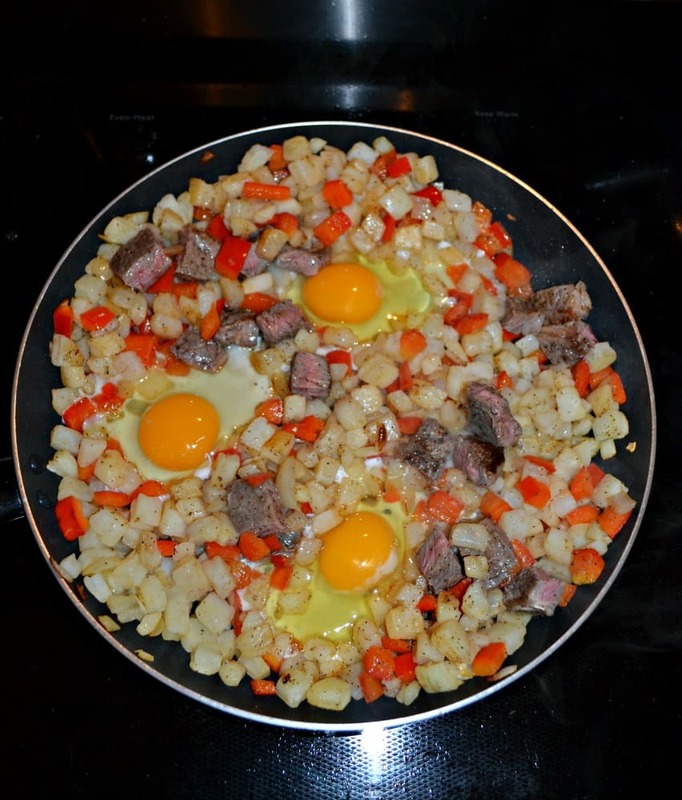 I really feel like I needed to up my savory brunch game so I thought I’d take this opportunity to try out a recipe for Steak and Eggs Breakfast Hash. I’m not a big breakfast eater though I’ve been trying to do better. While I do like pancakes or waffles on occasion, one of my favorite breakfast foods are hash browns. They are something I can always eat in the morning which is why I thought of this hash. 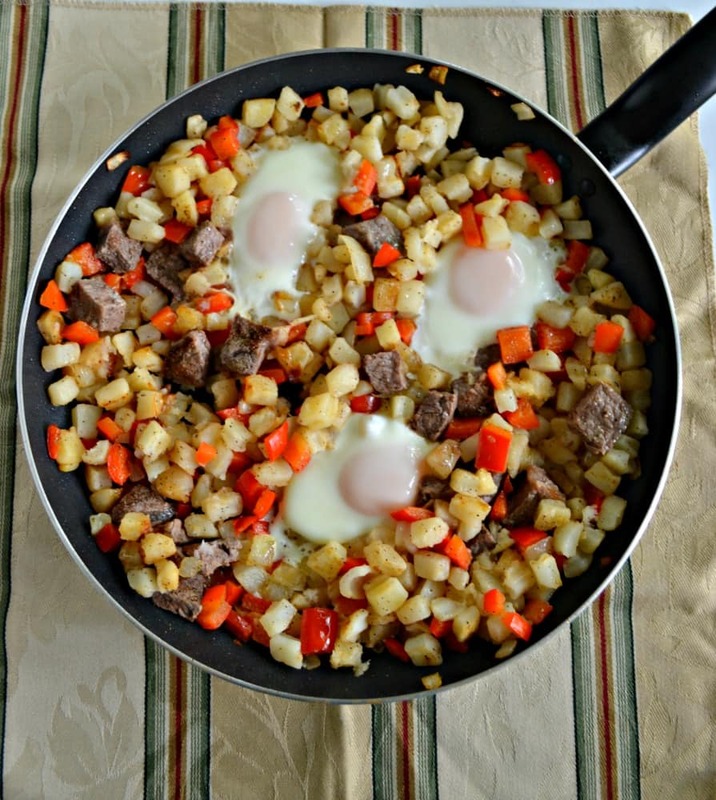 Since we’re using beef I thought a Steak and Eggs Breakfast Hash would be the way to go. I went to my local Weis Market to check out what steaks they had. I wasn’t really sure what cut I wanted to use in my hash and going to the store helped. I settled on some thinner cut New York Strip Steaks which ended up working perfectly. They cooked up quickly in the pan and held up well in the hash. 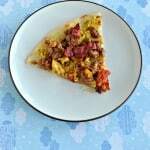 I like this recipe a lot because it’s easy to make, it makes enough for a crowd, and it’s a hearty breakfast. 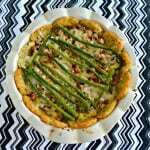 I had most of the ingredients on hand so it wasn’t anything I had to go out of my way to buy. The combination of the tender Certified Angus Beef® brand steak with the runny eggs and the hash browns was a delicious and hearty breakfast that kept me going all morning long. 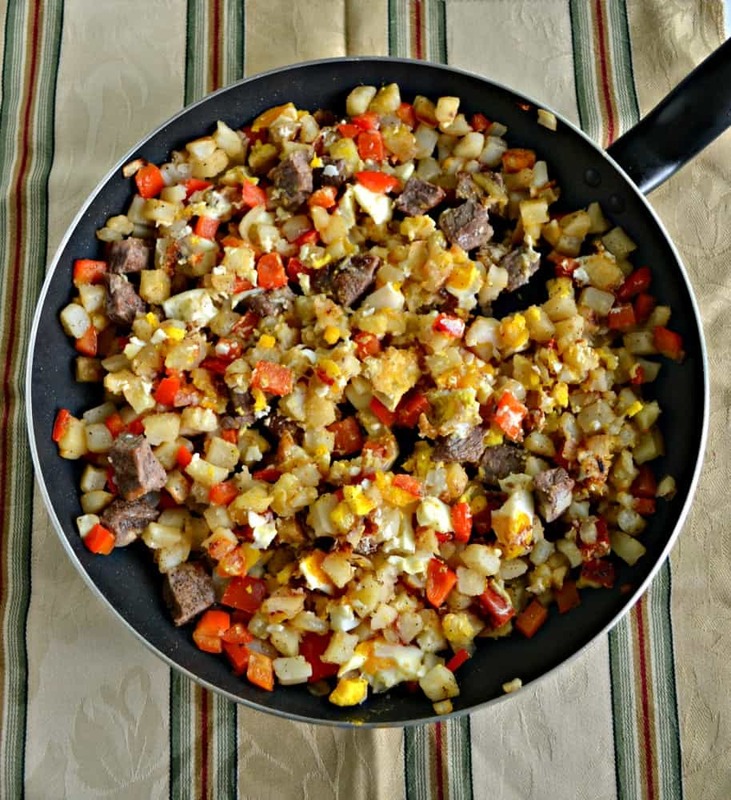 Make an easy, delicious, and hearty breakfast hash using Certified Angus Beef® brand New York Strip Steak, frozen hash browns, vegetables, and eggs. Heat one tablespoon of olive oil in a saute pan over medium high heat. Sprinkle the steak with salt and pepper and add to the pan. Cook for 3-4 minutes per side or until cooked to medium rare. Remove from pan. Add the remaining olive along with the hash browns to the pan. Cook for 5 minutes. Add in the onions, red pepper, and garlic. Saute for 5-7 minutes or until vegetables have softened and hash browns are cooked through. While the vegetables are cooking cut the steak into 1 inch pieces. Once the vegetables have finished cooking add the steak to the saute pan. Using a wooden spoon make three holes in the vegetables so that you can see the bottom of the pan. Crack an egg into each hole. Cover and cook for 5 minutes. Sounds like the perfect Sunday brunch! So excited for you and your baby Heather! You were missed on our trip, but you have the best present ever arriving soon! I love to eat hash and eggs for dinner! Thank you, you are totally right! I did miss you guys but it was for a good reason. 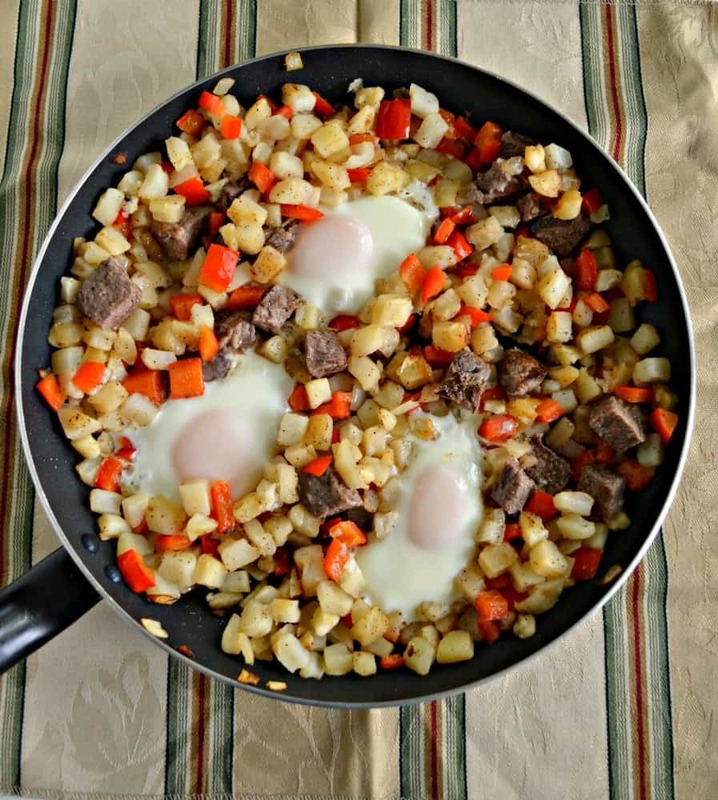 We enjoyed this Steak and Eggs hash for breakfast and lunch but it would be good for dinner too!